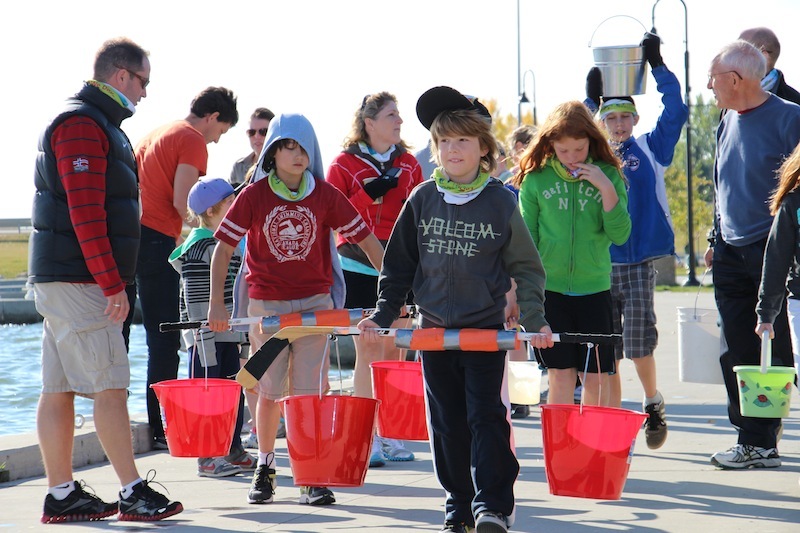 CHESTERMERE – About 100 people brought their empty pails, filled them with lake water and carried them for a few kilometers to have the opportunity to experience a Water Walk. This was all part of the exciting We Day Alberta events this fall. We Day is a cause agnostic platform that celebrates the youth movement for global change. What is a Water Walk? It’s simple. The Young Presidents’ Organization (YPO), World Presidents’ Organization (WPO) and Entrepreneurs’ Organization (EO) Members’ children raise money to build water well in Africa. 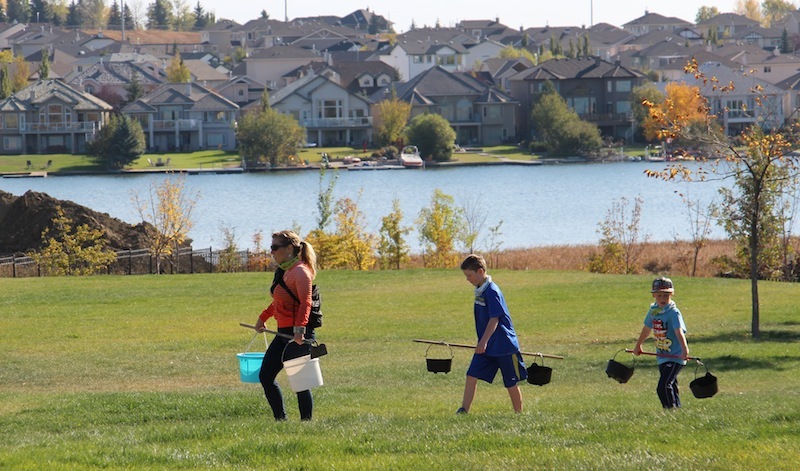 On Saturday, September 29th, the crowd filled their empty buckets and walked 5 kilometers starting off from John Peake Park, around the pathways of Chestermere and back to the park. The 5 kilometres is representative of the average distance women and children in under developed countries walk on average 3 times each day for their safe drinking water. By walking a “mile” (or a kilometer in this case) in their shoes, children will not only learn about the hardships of others in developing countries, but experience what many children must do every single day for their clean drinking water. And although we say clean drinking water, Dave Thompson, a volunteer, who has first-hand experience of going on a Water Walk in Africa, says the clean water there looks more like chocolate milk. “There are people and elephants bathing in the river and this is the only source of water for many people there” said Thompson. Thompson, his son, two friends took the journey to Africa a couple of years ago to build a school for one of the villages; this is where they got involved in the Water Walk movement. “Fifty percent of Africans have health problems which are attributed to the water they drink” added Thompson. The group was hoping to raise enough money to drill 3 much needed water wells for an African village. Live music at the event was provided by Minerva and after the walk there were lots of fun activities and plenty of hot dogs and drinks to go around for the water walkers.